CLEARWATER, Fla. — The Toronto Blue Jays were defeated 13-6 by the Philadelphia Phillies in spring training action on Thursday as the team was dealt a battery of bad news on the injury front. 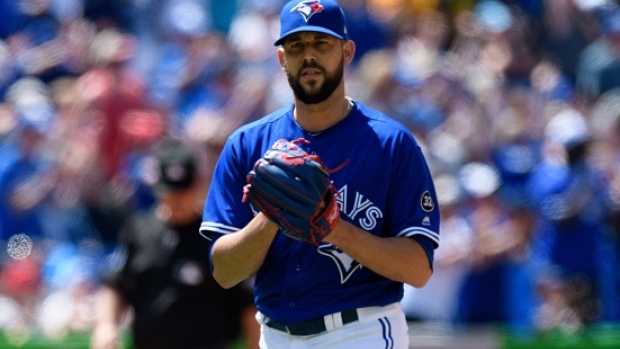 According to the Blue Jays' website, relievers Ryan Tepera and John Axford have suffered injuries that will keep them out for at least the start of the season. Tepera has been diagnosed with inflammation in his right elbow while Axford, of Simcoe, Ont., has a stress reaction on a bone in his right elbow. Both players are scheduled to be re-evaluated later. Meanwhile, outfielder Dalton Pompey of Mississauga, Ont./, was scratched from Thursday's lineup when he bumped his head on a bat in his locker. Pompey has a history of concussion issues. And reliever Bud Norris was scheduled to pitch an inning of relief in Thursday's game, but was pulled for an unspecified issue during his warmup. The injuries leave the Jays' bullpen depleted heading into the season. Toronto plays its opener against visiting Detroit on March 28. Starter Sam Gaviglio was roughed up in Thursday's pre-season game, surrendering eight earned runs over 3 1/3 innings. Gaviglio gave up a two-run home run to Bryce Harper, the first of two homers on the day for the new Phillies star, as well as a two-run shot to Andrew McCutchen and a three-run homer to Andrew Knapp. Randal Grichuk, Lourdes Gurriel Jr., Rowdy Tellez and Billy McKinney homered for the Jays. The teams combined for 10 home runs overall. The Blue Jays continue their spring training Friday night in Baltimore.